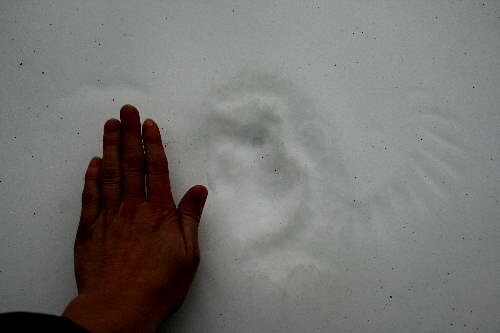 One of the hardest things to photograph is a track or print in the snow. All the same colour, with virtually no contrast. But I did my best with this one, tweaking it a bit in Photoshop to help bring out the details. Dan found this near the tractor shed while out with Raven a couple of days ago, before we got flooded with rain. The area is at the edge of the fields that surround our house, in a narrow strip of deciduous woods that separates our property from that of our neighbours. 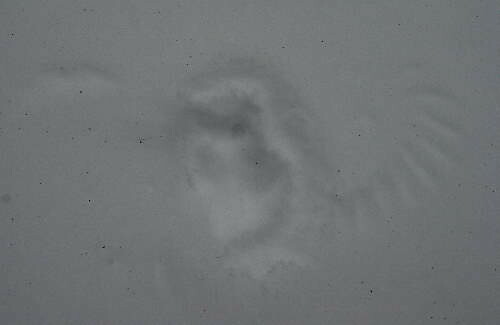 It was obviously made by a bird, most likely swooping down to the ground to pounce on something, although I’ve seen marks like this made by startled grouse that pop up from the ground to take off. There weren’t any tracks leading up to it, though, and it wasn’t close enough to cover for it to have been a grouse asleep in a snow hollow. The size of it (see next photo) and these circumstances led Dan and I to believe this print was made by a Northern Saw-whet Owl. These little owls are chunky birds, their bodies roughly the length and breadth of your flat palm. They’ve got relatively stubby wings, short and broad. And they typically forage from a low perch, pouncing on prey that’s traveling on or underneath the snow. Lending strength to our hypothesis is the fact that on a couple of nights just recently we’ve heard a saw-whet calling from the woods bordering our property. While it’s possible that the calling individual might be one that’s passing through, there are patches of ideal habitat on the neighbouring land, and saw-whets were recorded breeding in the region during the most recent bird atlas. Saw-whets, like most owls, are also early breeders, though not quite as early as some of our local species, such as the Great Horned. Saw-whets would be starting to court now, and find and establish nest sites. Eggs will likely be laid in three to four weeks. Though these little owls will take a variety of small vertebrates as prey, their primary food item is voles. We have no shortage of voles around here, which like the wide meadow habitat. When food is plentiful, saw-whets may catch more than they need and cache some instead of eating it immediately. When they’re ready to return to it, they thaw it out by holding it in their feet on a branch and sitting on it, tucking it into their belly feathers like they would do with an egg they were brooding. A pretty neat find! We’ll keep our ears open in the evenings to see if we can determine where the bird has set up a territory, if it is indeed breeding here, and then in a few weeks try to locate its nest cavity. Great find and interesting subject. You have a wonderful blog and I enjoy your passion for nature. And as for getting details in a track in snow… using the manual levels adjustment in photoshop can usually do the trick utilizing the low and mid sliders for shadow detail while keeping the brightest areas of snow at about 220-230 RGB. Also, if you use the auto exposure settings on your camera you’ll underexposure a snow scene like this. You need to open up around two stops otherwise your snow will be gray. Same idea if you auto expose an all black subject… it will come out gray. It’s the nature of an averaging meter. BTW, if you want to sharpen your skills in photoshop, I highly recommend a book entitled CS5 for Nature Photographers. It’s superbly written and there are used versions for older versions of CS. Thanks for the tips, Richard! I’ve always struggled with snow photos. I usually use the Av setting on my camera, and if I’m taking photos of a dark object on a snowy background I’ll bump up the exposure a few notches, but I’ve yet to figure out how to take good photos of the snow itself. I’ll definitely have a look for that book you recommend. You’re welcome… I hope I’ve helped. Using the camera’s averaging meter and photographing a dark object on a snowy or bright background creates another problem. If you photograph an all white scene (such as all snow) you need to open up about two stops to get the white to appear white. If you photograph an all black scene you need to stop down about two stops to get the black to appear black or dark. If you want that dark object (assuming it is small compared to the size of the background) to have a good exposure with the white or bright background then it is best to use a spot meter on the subject if your camera has one or possibly manually open up only one stop. It ends up being a compromise. If you take the image with the auto exposure settings, the snow will be gray while the subject will be underexposed. If you only open up one stop instead of two the snow won’t be pure white but the subject won’t be brighter than normal. You may even have to overexpose the background to get the subject to appear correct if the subject is very dark in color. The best way to see and understand this is to experiment and take auto exposures of a white sheet of paper and a black one. Discover for yourself what exposure corrections need to be made to get your subject to appear as natural. Place a dark object on a white sheet of paper, take an auto exposure and check your results. One positive of digital photography is that you can experiment to your heart’s content and get instant feedback.